The Tocal Chapel is a magnificent structure in the heart of the College campus. It is one of the original buildings on the campus. The spire of the Chapel is 40 metres high and the stainless steel cross on the top weighs 1 tonne. The spire is supported by buttress walls and held in position by the suspended king pole. This pole is tallow wood formed in three sections (diameter 45cm). In the floor under the pole is a marble plaque with the inscription ‘In commemoration of the Benefactor Charles Boyd Alexander’. 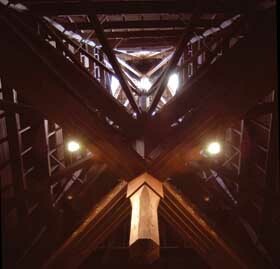 Below: photo of the inside of the chapel spire. Behind the altar hangs a specially commissioned tapestry by Margaret Grafton. The tapestry depicts Isaiah’s vision of peace (‘wolves and sheep shall live together in peace, and leopards will lie down with young goats. Calves and lion cubs will feed together, and little children will take care of them’, Isaiah Chapter 11 verse 6 GNB). The captivating image is created with hand-spun Australian wool treated with natural dyes of red cochineal and onionskins amongst others. It took 18 months to compete and was the first Australian tapestry to be commissioned by an architect in conjunction with the design and construction of a building.